SchoolGrown One was our first Community Hub and home to the first LEAF system, in Half Moon Bay, California. It started in August, 2014 and operated through August, 2015. It shares a one of three ridges at the Ouroboros Farms greenhouse. Ouroboros Farms fills the other two ridges with a commercial system. A retail space at the front of the building provides aquaponics system supplies and includes a farm stand for produce sales. Construction of the LEAF system began in August of 2014, with the help of many amazing volunteers. The system was filled with water in September, moments before tours from the Aquaponics Association conference tours began arriving. Many wonderful things have happened in this space. It was home for our first, full-scale LEAF system The Playground provided a space to construct different system designs in and our classroom space hosted many workshops on multiple subjects. where a number of activities take place. Experience a LEAF greenhouse system in person! Pictures and descriptions of the size and how the system works do not make the same impact as seeing a life-sized version in person. Bringing visitors on school properties is not a practical thing to do. So, in this public greenhouse, we are able to give interested parties the full experience of what a LEAF can do. 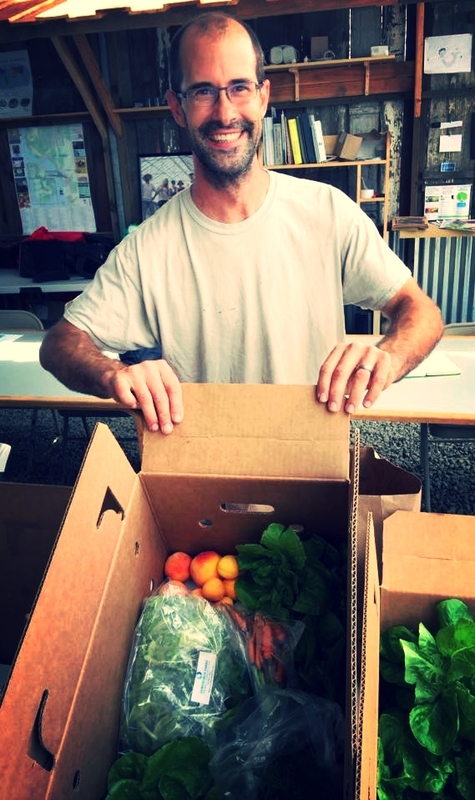 Get a CSA box of fresh produce from our LEAF, harvested every Tuesday, and ready for pickup between 2:00 - 4:00 PM. Your for any donation amount. Available while supplies last, first come first served. Add the banner to your webpage, or social media, and link to our calendar page to connect others with SchoolGrown classes and events. Communities gather and learn about aquaponics and whole array of sustainable living topics, including: tomato and mushroom growing, greenhouse design, composting, and bio-char. Workshops are facilitated by Jon Parr and Sundown Hazen, as well as guest speakers that bring their talent and experience to our community. See when the next workshop is on our calendar page. Between the classroom and the LEAF system, is a large space we call The Playground. Part shop, part demonstration the space is home to a number of different sized aquaponics systems, including SchoolGrown@home systems, demonstrations of different aquaponics methods, and various composting systems. Here visitors have a chance to see how aquaponics could fit into their homes, and participants in our Intermediate and Advanced classes get a chance to practice the skills needed to build their own systems. Come to one of SchoolGrown's workshops. Proceeds benefit the operations at SchoolGrown One, Half Moon Bay, California. Explore topics in sustainable agriculture and aquaponics. All donations made with this link will be used to the benefit of the SchoolGrown One, Half Moon Bay, California location. You will receive a thank you email with tax deduction information. We are pending approval for 501(c)3 and donations can be retroactively made tax deductible once we are approved. Once the stock is sold out, this design will not be printed again.